A mixture of flat, time trial and mountain stages will see a tussle right to the very end of next year’s Giro d’Italia, the route of which was unveiled today in Milan. Three individual time trials plus a team race against the clock will give TT specialists something to cheer about, but a very tough final week will swing the pendulum back in favour of the lightweight riders. The race begins in Holland on May 8th with a flat, 8.4 kilometres time trial around Amsterdam, and gives riders such as Bradley Wiggins the chance to take an early lead. Two stages for the sprinters then follow, a 209 kilometre race to Utrecht and an identically-distanced race from Amsterdam to Middelberg, with the riders then travelling back to Italy on Tuesday May 11th, the first rest day. 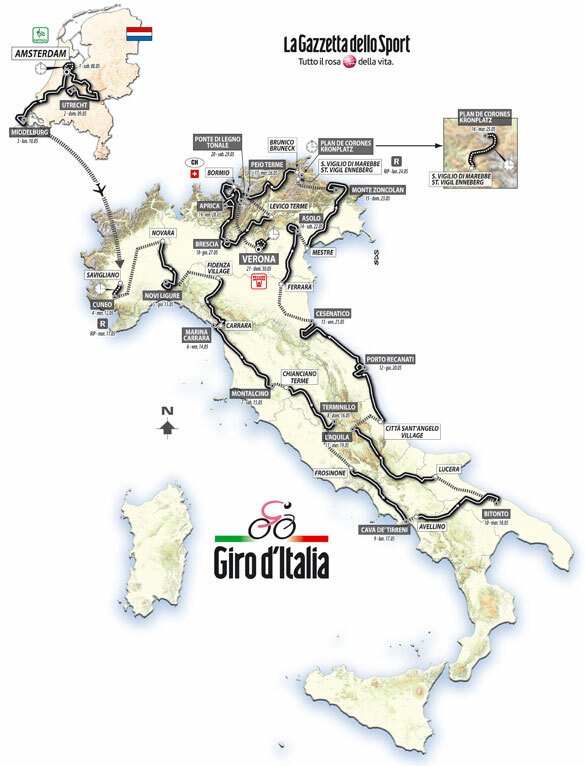 The action resumes with a 32.5 kilometre team time trial from Savigliano to Cuneo, then one lumpy stage (to Novi Ligure, 168km) and a hilly leg (to Carrara, 166km) will give the breakaway specialists a chance to aim for the race lead and stage wins. The middle of these three stages mark the 50th anniversary of the death of Fausto Coppi by passing through his hometown of Castellania. Another lumpy race to Montalcino (215km) includes two hilly gravel seconds used in the Eroica race and should be visually spectacular. That precedes the first big mountain stage of the Giro, a 189 kilometre race from Chianciano Terme to the summit finish of the Terminillo. That will shake up the general classification before handing the stage back to the sprinters and their teams with two mainly flat legs, a 188 kilometre stint to Cava De Tirreni and a 220 kilometre stage to Bitonto. Following this halfway point, the race will move into more mountainous terrain. However the climbers will have to be patient for a while longer. While the profile is continuously up and down on Wednesday May 19th, when the riders will race 256 kilometre to L’Aquila, the final few kilometres are quite flat. Bunch sprints are likely on the next two days, to Port Recanati (191km) and Marco Pantani’s hometown of Cesenatico (222km), but the 1675 ascent up Monte Grappa should break things up nicely before the stage 14 finish in Asolo. Sunday May 23rd will see full out war between the GC contenders, with a tough 218km mountain stage taking the riders to the top of the ferocious Monte Zoncolan. A rest day gives the riders but a brief respite before the crucial six final days of racing. The first of these is a very tough 12.9 kilometre mountain time trial from San Vigilio di Marebbe to St. Vigil to Plan de Corones/Kronplatz. A section of 24% steepness near the summit will make things atrociously hard and could see big time gaps open. The next stage to Peio Terme (173km) is not quite as hard but the ascent of the Passo delle Palade just over halfway through plus a gradual drag up to the finish will demand attention from the race leader. He should have an easier day on the following stage to Brescia, given that the flat 151 kilometres appear tailor made for a bunch sprint, but the saw-tooth profile of stage 19 to Aprica (195km) includes the leg-breaking Mortirolo climb and will hurt. Another crocodile-mouth outline defines the 151 kilometre to Tonale; these two days will give his climbing rivals two final chances to wrest the Maglia Rosa off his shoulders. Whoever leads on the evening of Saturday May 29th will feel good about his chances, but there’s one more test before the celebrations can start. A 15.3 kilometre time trial through Verona will take the Toricelle climb used in the 1999 and 2004 world championships and make a race against the clock even tougher. Overall, the route is one which does favours for both the time trialists and the climbers, while also not forgetting about the sprinters. There’s something for everyone, but not necessarily everything for someone. By that we mean the route isn’t biased in one direction, although if Denis Menchov can rediscover the form that deserted him so dramatically in this year’s Tour, he all-round ability could see him take back to back Giro wins.